All construction trucks basically look the same. The above four trucks are all yellow, and have wheels. 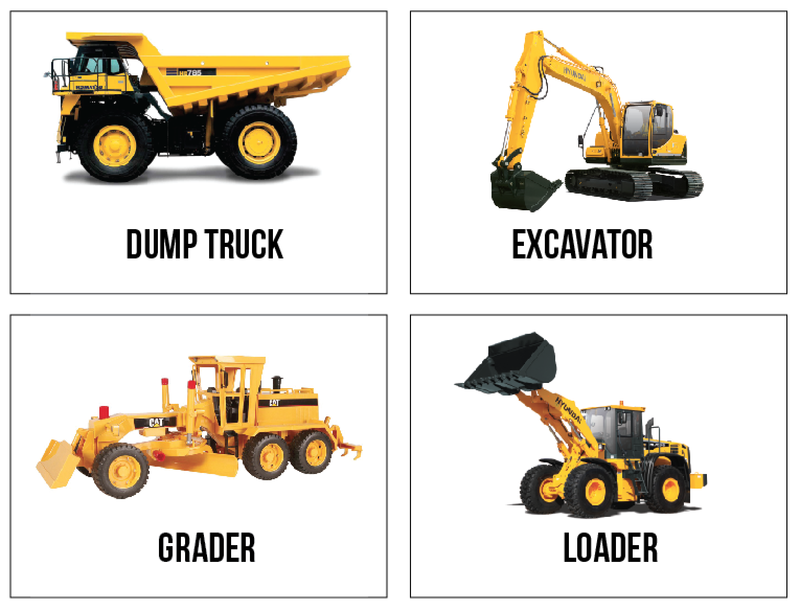 They’re all called “scoopers” or “dump trucks” at our house. But upon the recent finding of one of Tyler’s favorite childhood books featuring Dan and his Mighty Dump Truck, we’ve needed to learn the real names for these. I’ve learned the boys in our house can be quite persnickety when Mom calls the “loader” a “bulldozer”. Ooops. And I still never seem to get it right. Download and print 8 construction flashcards so you can learn the names, too. Because I’m hoping you’re all like me. I’m debating whether or not I should show this to my husband…. He would think it’s the coolest thing ever. Only thing that would make it better is if they were all CAT machines. My father-in-law works for CAT and I’ve slowly learned a few names, but still forget them. :) You should do John Deere tractors next!